Musa Aman tabling the 2014 Sabah Budget at the State Assembly Friday afternoon. BI photo. 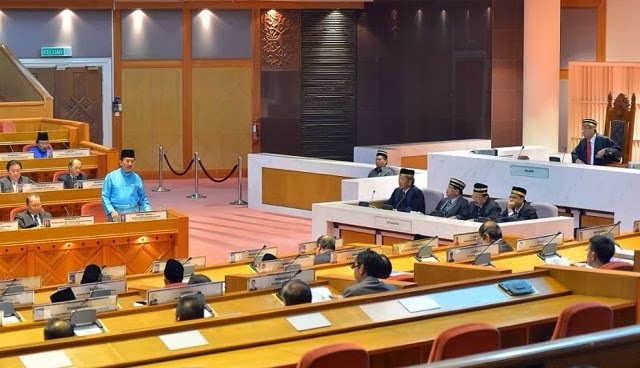 Chief Minister Datuk Seri Musa Aman yesterday tabled a deficit 2014 State Budget of RM4.622 billion, which is RM534 million more than the estimated provision in 2013, discribing it as the ‘best gift ever for the people of Sabah’. to achieve balanced regional development. Emolument has increased by RM39.34 million or 5.93 per cent compared to the total of RM663.17 million in 2013 due to salary adjustments for State civil servants under the Malaysian Remuneration System which was implemented in 2013. And, to ensure that the Government’s machineries run smoothly at maximum capacity, effective and efficient in the effort to improve the Government’s delivery system for our beloved people, the estimated recurrent expenditures for the coming year is increased by RM648.66 million or 59.62 per cent compared with the estimated recurrent expenditures of RM1,087.93 million for year 2013. The increase in the allocation is also due to repayment of Government bonds maturing in 2014 amounting to RM568.9 million and repayment of Federal Government debts amounting to RM171 million. Special Expenditure shows a decrease of RM154.98 million or 6.63 per cent compared to RM2,337.38 million for 2013. “This year, the Government made numerous equity investments in Government agencies and hence the reduction in 2014. Nonetheless, the State Government will ensure that our development agenda and investment will continue to be intensified specifically on high impact projects that can further spur the State economic growth,” Musa explained. He also said that with the biggest expenditure recorded in the financial history of the State budget, it will boost the economy of Sabah and enable it to grow to a higher scale and thus achieve a high income economy within a short span of time,” said Musa. The Finance Minister is also confident that people from all walks of life, regardless of religion, race, gender, rich or poor, old or young, physically fit or those who are physically challenged, wherever they may be on land or sea, will benefit from the just unveiled State Budget 2014. “With a projected revenue of RM4.583 billion for the year 2014, which is the highest estimate in the history of State budget preparation, the 2014 Supply Expenditure, which is also the biggest budget in the State financial history, is estimated at RM4.622 billion, in order to meet the people’s expectations, to continue our development agenda and most importantly to fulfil our promises." “Sabah played a major role in the formation of Malaysia since 50 years ago. During those five decades, the people of Sabah have gone through various experiences, through thick and thin in politics, economy, social, and education, to mention some. Over 50 years the estimated revenue has increased remarkably by 74.52 times and the estimated expenses by 75.77 times." TheGreenMechanics: We have one of the biggest state budgets in the country (if not the biggest) and no provision for Sustainable, Efficient Energy or Renewable Energy promotion. Just days earlier the CM pledged the government support for renewables. It apparently is not translated into tangible effort. i was wondering how is the state going to strengthen it's financial position with a deficit?Tak masuk akal. I think we all do, especially on security.